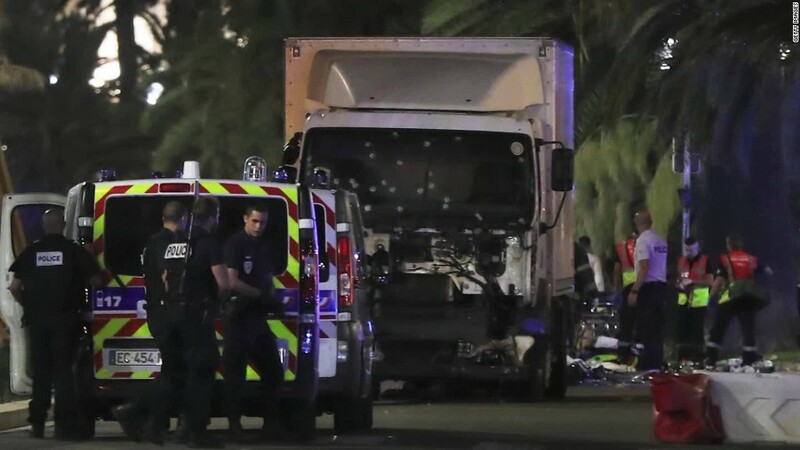 An attack in Nice, France, during a major national holiday has killed at least 80 people. It's the latest in a series of deadly terror attacks in France since the beginning of last year. The mood in global markets has switched from optimism to pessimism. 1. Global stock market overview: U.S. stock futures are slipping lower. This follows a five-day record-setting rally. Both the Dow Jones industrial average and S&P 500 closed at their highest levels ever on Thursday. European markets are mostly down in early trading, with travel and airline stocks getting hit hard as investors worry that the Nice attack will further deter tourists. A major profit warning from Swatch Group (SWGAY) is also hurting the luxury sector in Europe. Shares in Swatch are down by well over 10%. Asian markets mostly closed the day with muted gains. 2. China slowdown: China's National Bureau of Statistics reported the economy grew 6.7% in the second quarter compared with the same period last year. That is a hair better than the 6.6% forecast in a CNNMoney survey of economists, and unchanged from the first quarter. However, growth has now slowed to levels last seen during the dark days of the global financial crisis in early 2009. And economists see more challenges ahead for the world's second biggest economy. 3. Earnings and economics: Citigroup (C), Wells Fargo (WFC) and Infosys (INFY) are set to report earnings before the open. The U.S. Census Bureau will release its retail sales report for June at 8:30 a.m. ET. At the same time, the Bureau of Labor Statistics is releasing inflation data for June. The May report showed consumer prices were barely rising, up just 0.2%. 4. Investors line up for Line: Shares in Line (LN) closed with a 32% gain on Friday in Tokyo, marking a roaring market debut. Line is the operator of a Japanese messaging app that's popular in Thailand, Indonesia, Taiwan and Japan. Shares in the company also debuted in New York on Thursday. Line has about 218 million monthly users and offers a mish-mash of services similar to WhatsApp, Skype, Twitter, Zynga, Spotify and Uber.